About a silence so loud I thought my ears would burst like a body under miles of water splitting apart from the pressure. Silence being such a heavy thing. My heart was beating painfully through my ears, yelling and reaching and falling short. You were reaching out to my feet, I remember in detail their trembling. You wanted to touch them so badly that I could see the desire consuming you but you shook with fear, a curious deep fear as I hovered between a now we were rejecting-would always reject, and a then that we couldn’t possibly understand. For a dear dear friend. Imprint in my brain forever long. Sometimes you just play the fool. Ever day just makes sense. For it came directly from you. 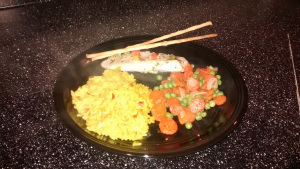 Today I made some citrus inspired Tilapia. 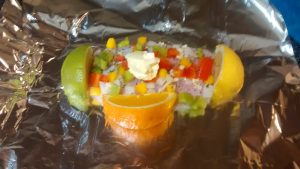 In center of square of foil place tilapia, spread onions, garlic, and bell peppers across, cover lightly with pepper and parsley, and place slice of lemon on one end, lime on other and orange slice in the middle. Put the butter in middle on top and wrap up to place on center rack in the oven for 20-30 minutes depending on your preference of doneness. Mebbe imma come back and make this active.